23 Eanáir – Ghabh an Chóiré Thuaidh an USS Pueblo agus a criú, ag maíomh go raibh an long Meiriceánach ina farraige theorann agus na Meiriceánaigh ag spiadóireacht. 30 Eanáir – Thosaígh an Viet Cong an tIonsaí Tet sa Vítneam Theas. 6 Feabhra – 18 Feabhra – Tionóladh Cluichí Oilimpeacha an Gheimhridh i Grenoble, sa Fhrainc. 24 Márta – Básaíodh 61 duine nuair a thit Eitilt 712 de chuid Aer Lingus in aice leis an Tuscar i gContae Loch Garman. 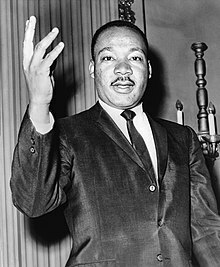 4 Aibreán - Feallmharaíodh Martin Luther King Jr., ceannaire de chuid an fheachtais ar son cearta sibhialta i Memphis, Tennessee, SAM. 20 Aibreán - D'éirigh Pierre Trudeau ina phríomh-aire i gCeanada. Bealtaine - Réabhlóid na mac léinn san Eoraip, i Meiriceá Thuaidh agus sa tSeapáin. 6 Meitheamh - Feallmharaíodh an seanadóir Robert Kennedy i gCalifornia. 12 Deireadh Fómhair - 27 Deireadh Fómhair - Tionóladh Cluichí Oilimpeacha an tSamhraidh i gCathair Mheicsiceo, i Meicsiceo. 5 Samhain – Fuair Richard Nixon an bua sa toghchán uachtaránachta ar Hubert Humphrey agus ar George Wallace sna Stáit Aontaithe. 4 Aibreán 1968: Feallmharaíodh Martin Luther King Jr. i Memphis, Tennessee, SAM. Tugadh an leathanach seo cothrom le dáta an 5 Eanáir 2019 ag 20:59.